According to Matthew Lipman, C.S. Peirce originally restricted the concept to the community of scientists. John Dewey broadened the scope of the concept, applying it to the educational setting (Lipman, 2003, pp. 20–21). Borrowing from Dewey, Lipman systematically applies the concept to the educational setting. He argues that a classroom is a type of community of inquiry, which leads to “questioning, reasoning, connecting, deliberating, challenging, and developing problem-solving techniques.” Students and teachers involved in inquiry form a community of inquiry under certain circumstances. Therefore, a holistic understanding of a community of students and teachers engaged in authentic inquiry is the working definition of the key term ‘community of inquiry’. There is a gestalt dimension to the concept that is underlined by Lipman. He points to “….the profound educational implications of fusing together, as Peirce had, the two independently powerful notions of inquiry and community into the single transformative concept of community of inquiry” (2003, p. 84). Lipman defined community of inquiry as a rigorous, democratic and reflective form of discussion built up over time with the same group of learners. Lipman also provides a useful set of antonymic statements that contrasts the standard educational paradigm with the reflective educational paradigm in which communities of inquiry can occur. 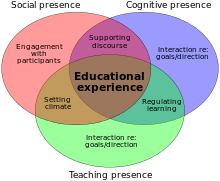 the educational process is not information acquisition but a grasp of relationships among disciplines (2003, pp 18–19). Patricia M. Shields has applied the community of Inquiry concept to the field of public administration. The community of inquiry is not defined by geographic location, rather a common desire by its members to resolve a problematic situation using a scientific attitude to assess evidence and guide action. The community is also defined by participatory democracy. "The parameters of the problematic situation and approaches to resolution are shaped by the interaction of the community and the facts". The democratic community may consider ideals/values such as equality, freedom, effectiveness, justice as it considers goals. There are three key ideas – "problematic situation, scientific attitude, and participatory democracy". Shields depiction is similar to Lipman's in that she refines the term inquiry by focusing on the problematic situations and scientific attitude (both concepts developed by Dewey in his book Logic: The Theory of Inquiry. Community is refined as participatory democracy. The two definitions are essentially the same. Shields draws heavily on John Dewey's insights into democracy and inquiry to refine the concept and apply it to public administration. ^ Seixas, Peter (1993). "The Community of Inquiry as a Basis for Knowledge and Learning: The Case of History". American Educational Research Journal. 30 (2): 305–324. doi:10.3102/00028312030002305. Retrieved 4 June 2012. ^ Shields, Patricia (2003). "The Community of Inquiry". Administration & Society. 35 (5): 510–538. CiteSeerX 10.1.1.1008.9702. doi:10.1177/0095399703256160. Retrieved 4 June 2012. ^ Pardales and Girod (2006). "Community of Inquiry: Its past and present future". Educational Philosophy and Theory. 38 (3): 299–309. doi:10.1111/j.1469-5812.2006.00196.x. ^ Shin and Bickel (2008) - in Chris Kimble and Paul Hildreth (2008). 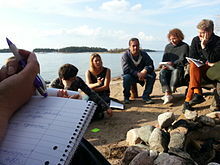 Communities of Practice: Creating Learning Environments for Educators. Information Age Publishing. ISBN 978-1-59311-863-1.